22nd Atlanta Tattoo Expo & Official Pre-Party! This is THE kick off party to be at! The 22nd Atlanta Tattoo Expo returns this year on August 17, 18 & 19! 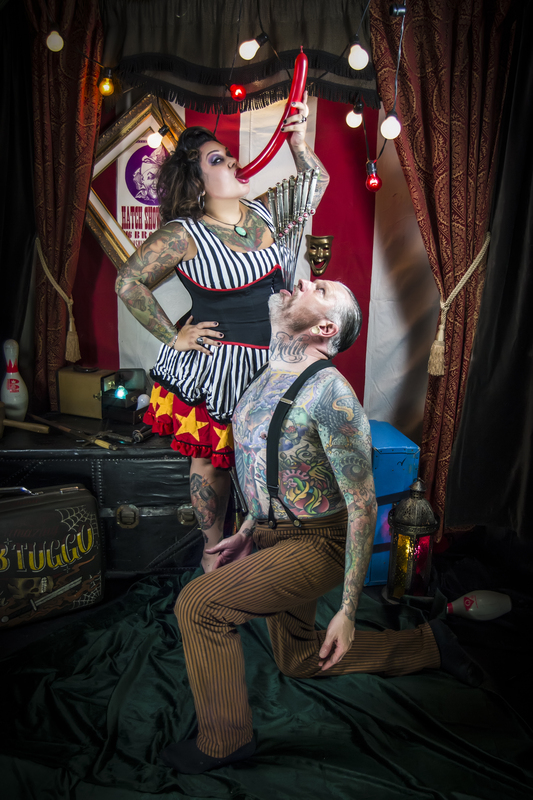 But before the Expo gets started, come on out to Clermont Lounge for a night of excellent entertainment featuring your hosts… Captain & Maybelle! Music from Kitty Rose & the Rattlers and the amazing ELZIG! Make your plans NOW, you won’t want to miss this! The Atlanta Tattoo Expo has been attracting thousands of attendees each year since 1996 – August 17th-19th, 2018 will be our 22nd year. The Expo was founded by Tony Olivas, one of Georgia’s premier tattoo artists, and owner of Sacred Heart Tattoo in Little 5 Points, Norcross, and Roswell, Georgia. It is already on track to be the biggest show in Sacred Heart Tattoo’s history. For 3 days, the beautiful Sheraton Atlanta Hotel will be transformed into the most visited artistic festival in Downtown Atlanta for thrilling days full of TATTOOS! The event will feature live tattooing of different methods and styles, competitions in varying categories, seminars for aspiring and seasoned tattoo artists, bikini contest and much more. The latest tattooing products will also be showcased. The Promotors have partnered with the Wounded Warrior Project’s, Warrior Care Network, to host special fundraising events that shall benefit the WWP’s Warrior Care Network. Warrior Care Network is more than a PTSD program, it is a first-of-its-kind partnership between Wounded Warrior Project and four national academic medical centers of excellence including Emory Healthcare, Massachusetts General Hospital, Rush University Medical Center, and UCLA Health. In cooperation with the Department of Veterans Affairs, this program will connect thousands of warriors with world-class care. Warrior Care Network is a $100 million commitment to battle the invisible wounds of war by filling gaps in government care and reaching those who might otherwise go untreated. Wounded warriors will be connected with partner hospitals for evaluation and treatment options, enabling life changing PTSD help. The Promotors – Tony Olivas and Larry Rodriguez look forward to your participation in the world class event. Your host and emcee for the Expo… Captain Steele! Welcome to the Nation’s Tattoo Expo, DC’s newest summertime tattoo convention, held June 1st-3rd, 2018 at Hyatt Regency Crystal City at Reagan National Airport, Arlington, VA! This summer, the nation’s capital will host more than 200 of the world’s BEST tattoo artists & receive an exclusive experience focused on tattooing and art. Also, don’t miss the unbeatable entertainment with Captain & Maybelle, the Miss Aloha Pin Up Contest and Suns Out Guns Out Dad Bod Contest! The Nation’s Tattoo Expo is brought to you by the DC Tattoo Expo, Exposed Temptations Tattoo and Eternal Ink. Tickets are sold at the door! By popular fan demand, DAYS OF THE DEAD is coming to Charlotte this spring and is bringing a full weekend of celebrity guests, film screenings, vendors, and special events, with it to the Sheraton Charlotte Hotel, May 18th-20th! Celebrity guests include CASSANDRA PETERSON (Elvira), DEE SNIDER (Twisted Sister), LINDA BLAIR (The Exorcist), TONY TODD (Candyman), a NIGHTMARE ON ELM STREET 3 reunion, and many, many more! When spring arrives in Historic Downtown Austell, it can only mean one thing – it’s time for a Festival! This year thousands of people will converge on downtown Austell for Austell Spring Festival, April 28th! There are surprises on every corner, whether it’s a tent filled with new treasures or your favorite food truck, the Festival features businesses and tent vendors with giveaways, offering everything from entertainment options for the little ones and fun for the entire family! This Spring festival is a Non-Profit event, remaining proceeds from this event will be donated to Sweetwater Mission. “HELLO! I AM THE PROMOTER OF THE TATTANOOGA TATTOO EXPO. I HAVE BEEN TATTOOING FOR 20 YEARS. I AM THE OWNER OF INKED EXPRESSIONS TATTOO STUDIOS LOCATED IN CHATTANOOGA, TN. AND EASTRIDGE TN. I HAVE WORKED MANY CONVENTIONS OVER THE YEARS AND STILL DO! FROM MY EXPERIENCE, MY CREW AND I ARE WORKING HARD TO CREATE AN ENTERTAINING AND BUSY SHOW . THAT IS WHY WE HAVE COMBINED A CAR AND BIKE SHOW ALONG WITH SOME GREAT SOUNDING LIVE MUSIC AND TOP NOTCH ENTERTAINMENT! THE GOAL WAS TO BRING ALL THE THINGS WE LIKE, TOGETHER TO HELP OPTIMIZE THE FLOW OF CLIENTS AND GIVE OUR GUESTS AN EXCITING EXPERIENCE. Tattanooga is held at the Camp Jordan Arena at 323 Camp Jordan Pkwy, East Ridge, TN 37412. If you have any questions, or trouble finding it, feel free to call 423-595-4703 or 423-994-5344. Hours are: Friday 1PM-10PM, Saturday 11AM-11PM, Sunday 11AM-6PM. Admission: 1DAY $20, 3DAY $45, and $5 off if you have a Bug-A-Palooza wristband! 16th Anniversary Carnival at Terrapin Beer Co.! Step right up, see the sights, drink the beer, enjoy the music! We’re celebrating our 16th Anniversary! Ticket includes beer samples, entertainment, a souvenir glass, and brewery tours! Barrel aged beers, year-round favorites, beers from our ATL Brew Lab at SunTrust Park, and other special brews will be available for sampling, along with unique casks made by our brewers! Entertainment will include the bands Rust and Strung Like a Horse, as well as acts from sideshow couple Captain & Maybelle. We’ll also have local vendors, food trucks, and carnival games. This year, our Anniversary Carnival benefits Nuci’s Space, a health and resource center for musicians as a safe space to seek support and guidance, provides access to affordable, obstacle-free professional care, actively participates in treatment and educates about awareness, prevention and the risk factors of brain illnesses. For every ticket sold, we’ll donate $5 to their organization.